Estás aquí: Libros de Texto > Libros de Texto ESO > Libros de Segundo ESO > English Alive! 2 Workbook (País Vasco), Oxford University Press España, S.a. The number one course for teachers of English in ESO. Now with a complete, flexible digital package to suit all needs. Portada: English Alive! 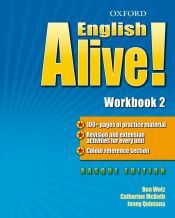 2 Workbook (País Vasco), Oxford University Press España, S.a.
El autor de English Alive! 2 Workbook (País Vasco), con isbn 978-0-19-471009-1, es Ben Wetz;catherine Mcbeth;jenny Quintana.